On a recent trip to Dubai I had a fish pedicure. It was definitely an experience. I always wanted to do the fish pedicure and when I saw it I couldn’t pass it up. Let me tell you that I don’t like fish swimming at me or around me, like when I snorkel or swim in the ocean. I don’t know what I was thinking when I thought it would be a good idea to let them eat the dead skin off my feet. I had gotten a gel pedi the day before and they really scrubbed my feet so I thought it couldn’t be that bad the fish wouldn’t really have any skin to eat. I was so wrong! Let me tell you how it starts, they put you in a little room where they began washing your feet before you put them in the fish tank. This part is amazing, you put on a robe and they wash your feet and up to your knees really nice. They give you a little massage and then you put on these disposable shoes and walk over to the fish tank. If you have any cream, lotion or anything on your legs when the fish eat your skin it will kill them (I wanted them to wash my legs and feet well because I didn’t want the fish to start dying while my feet were inside). Now comes the fish part, I climbed up to the chair to put my feet in the tank and looked down at all the fish swimming and freaked out. I was thinking to myself there is no way I’m putting my feet in this tank. The fish are tiny but there are a lot of them. Finally after all the ladies and my friend encouraging me I put the tips of my toes in the water. I was surprised that the water was warm. No fish came to my toes so I thought there is no dead skin on my toes and these fish were just going to swim around me. 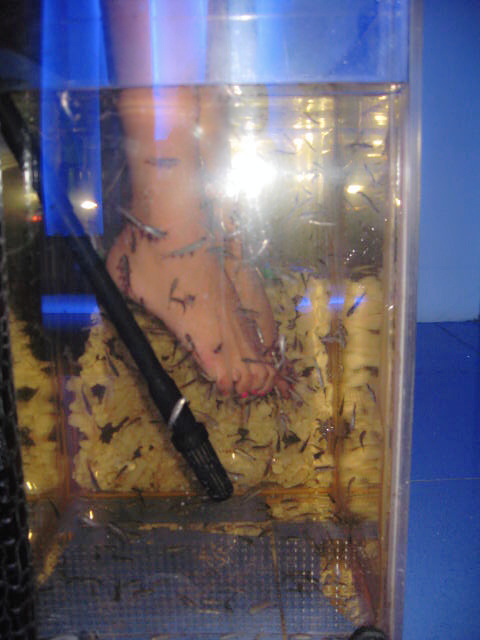 I slowly lowered my feet and legs in the tank and then all of a sudden I was attacked by hundreds of little fish. I quickly pulled my legs out of the water. The feeling was like nothing I have ever experienced. It was ticklish and gross all at the same time. My friend forced me to keep my legs and feet in the water (mind you she didn’t do it, she just watched me do it). I kept trying to shake the fish off of my feet then finally I just closed my eyes and breathed through it. The worst part was the fish eating the skin that was in between my toes, the sensation is weird. So when my 15 mins were up (it felt like an hour) they take you back to the foot washing station. Rinse the water, put lotion on your feet and your done. When I touched my feet to see how soft they really felt, I couldn’t believe it!!! It was amazing. If I had known the results I would have really powered through it not shaking the fish off of my feet and pulling my feet in and out of the water. I couldn’t stop touching my feet. I wish they had these little fish in LA. I would do it all the time and my hands and arms. If you get the chance try it. But if you hate the feeling of your feet being tickled you will hate this its like that times a million. You will love the results! Bottom line, I’d do it again. The results were worth the uncomfortable feeling. I like reading your website. This looks too scary for me to try.